A class-action lawsuit filed against several U.S. government officials claims a newly updated policy expanding the collection of biometric and biographical data is unjustly resulting in the prolonged imprisonment of unaccompanied immigrant children and potentially aiding immigration enforcement agencies in the capture of other individuals. The lawsuit specifically addresses an Office of Refugee Resettlement (ORR) policy that requires all adults living in the same household as a family member who’s sponsoring a detained child to turn over biometric and biographical data, including fingerprints and sometimes photographs. The complaint seeks, in part, to find out whether this data collection is “arbitrary, capricious, or otherwise contrary to law” under the Administrative Procedure Act. The lawsuit was filed by the Legal Aid Justice Center in the U.S. District Court for the Eastern District of Virginia on behalf of all children currently or subsequently in the custody of the ORR or the state of Virginia from July 20, 2017, onward. 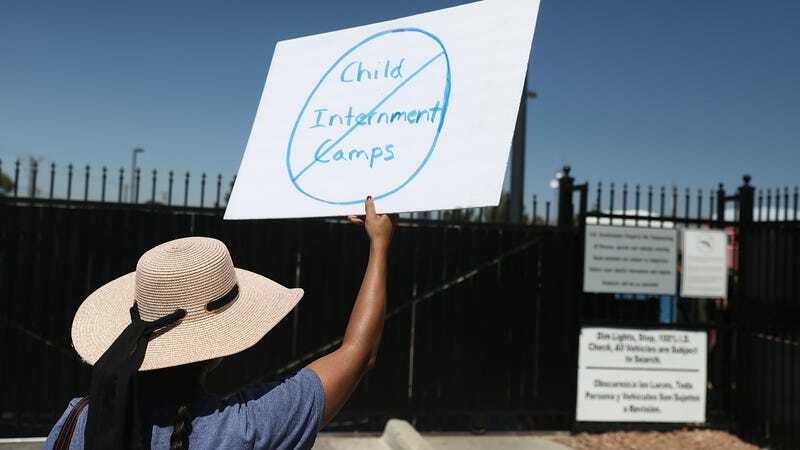 The class action also applies to anyone who applied to be a sponsor of a detained child but did not give up the biometric data of every adult in their household, resulting in the child’s continued detainment. In April, Steven Wagner, the acting assistant secretary for the Administration for Children and Families under the U.S. Department of Health and Human Services, and Scott Lloyd, the director of ORR, signed a Memorandum of Agreement (MOA) with Customs and Border Protection and Immigration and Customers Enforcement to, as the lawsuit describes it, “vastly expand” what information sponsors and other adults living in their households must hand over—information that could be shared among the agencies. Both Wagner and Lloyd are listed as defendants in the lawsuit along with ORR Deputy Director Jonathan White, HHS Secretary Alex Azar, and a federal field specialist at ORR, Natasha David. ICE and CBP declined to comment and instead directed Gizmodo to contact HHS. Because of this new intrusive policy—requiring all adults in a sponsor’s home to give up their biometric and biographical data—a minor currently detained in a high-security facility is unable to reunite with his family because other adults in their sponsor’s household are afraid to share this type of information with the agencies, the lawsuit asserts. “Caregivers at risk of detention or deportation are forced to choose between getting their child released from ORR custody and their own ability to remain out of detention and in the country to provide care [for] their children,” the lawsuit states. The biometric data collected includes fingerprints and sometimes photos, while the biographic data includes basic info such as their name, age, date of birth, and address, Legal Aid Justice Center attorney Rebecca Ruth Wolozin told Gizmodo in an email. She characterizes this policy as “more intrusive than what ORR has done in the past,” and said that there is “no precedent for a policy of vast information collection and sharing like this.” She also noted that there’s no requirement or indication of “probable cause” that would necessitate such a policy. The plaintiffs argue that this policy violates the Trafficking Victims Protection Reauthorization Act (TVPRA), the Administrative Procedure Act, and the Due Process Clause. An unnamed boy identified as the lead petitioner on the suit has been in ORR custody for almost five months even though his brother-in-law has applied to be his sponsor and provided the program with his biometric and biographical data, according to the lawsuit. The lawsuit also claims that he has been close with his brother-in-law since he was a toddler, and spoke with him and his sister on the phone regularly before coming to the United States. The child’s “prolonged imprisonment at a young age, and his inability to be with his family has caused him significant anxiety and sadness,” the lawsuit states. “He often cries when speaking to family members on the phone and is struggling to cope with the daily bullying he experiences at” the detention center. On Tuesday, Matthew Albence, ICE’s head of enforcement and removal operations, described the immigration detention facilities as “more like a summer camp than a jail.” It’s a breathtakingly tone-deaf remark amid numerous reports suggesting otherwise. The Trump administration’s policy to separate migrant children from their parents itself was deemed “a form of child abuse” by healthcare professionals. The facilities have come under fire after reports of neglect, sexual abuse, and overall traumatic circumstances. A Reveal report from June alleged that immigrant children at a facility in Texas were forced to take psychiatric drugs. And the American Immigration Lawyers Association said on Wednesday that a migrant child died soon after leaving an ICE detention facility in Texas. This new policy from ORR only stands to create yet another obstacle between detained children and a loving support system. It effectively turns a child into bait, pinning their reunification with a loved one on all adults in that household—adults who may understandably be fearful of how the agencies might use their sensitive information.